New Delhi – No tax would be deducted at source for PF withdrawals of up to Rs 50,000 from June 1. The government has notified raising the threshold limit of PF withdrawal for deduction of tax (TDS) from existing Rs 30,000 to Rs 50,000, a senior official said. The provision will come into effect from 1 June 2016, providing relief to subscribers of retirement fund body EPFO. The government had introduced the proposal to deduct TDS on PF withdrawals in order to discourage pre-mature withdrawal and to promote long-term savings. According to existing provisions, TDS is deducted at the rate of 10 percent provided PAN is submitted. TDS will be deducted at the rate of 10 percent provided PAN is submitted. However, in case Form 15G or 15H is submitted by the member, then TDS is not deducted. These forms are to declare that their income would not be taxable after receiving payment of their PF accumulations from retirement fund body EPFO. While Form 15H is submitted by senior citizens (above 60 years of age), Form 15G is submitted by claimants below the age of 60 years. TDS is deducted at the maximum marginal rate of 34.608 percent if a member fails to submit PAN or Form 15G or 15H. However, there are certain exceptions to deduction of TDS by EPFO. However, there are certain exceptions to deduction of TDS by EPFO. TDS shall not be deducted in case of transfer of PF from one account to another PF account. The government is considering rationalising tax deducted at source, according to recommendations made by the R V Easwar Committee. 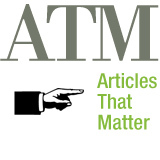 Officials said the changes in tax deducted at source (TDS) rates and thresholds would not have a significant revenue impact. Revision of the tiny annual limits, which were long overdue, would, however, benefit small depositors and pensioners, they added. “For the Budget, we will be looking at recommendations that do not have large revenue implications. For the rest, we will have to do the math on the tax revenue foregone,” said a government official. The panel has suggested reducing the short-term capital gains tax on annual earning of less than Rs 5 lakh from trading of shares and not treating it as business income. This will have a significant revenue implication when the government is trying to lower the fiscal deficit to 3.5 per cent of the gross domestic product (GDP) in 2016-17 from the projected 3.9 per cent in 2015-16. Budget may offer TDS relief to taxpayers The committee has recommended reduction of the TDS rate for individuals and Hindu Undivided Families (HUFs) to five per cent from 10 per cent. For interest on securities, it has proposed raising the threshold for TDS to Rs 15,000 from Rs 2,500 annually and halving the tax rate to five per cent. For other interest earnings, the limit recommended is Rs 15,000, up from Rs 10,000 for bank deposits and Rs 5,000 for others. “The thresholds are unfair to pensioners and widows, who have all their savings in fixed deposits. The average rate of tax has fallen, but these thresholds have not gone up. Why should they suffer tax at 10 per cent when the average rate of tax is somewhere at five per cent,” Easwar told Business Standard. 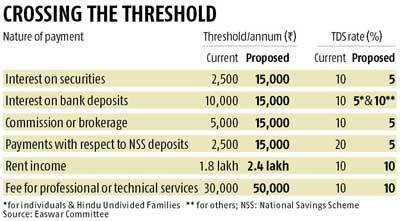 The 10-member panel has recommended a hike in the TDS threshold for payments in respect of NSS (National Service Scheme) deposits to Rs 15,000 from Rs 2,500, and reducing rates from 20 per cent to five per cent. The panel has also suggested raising the TDS limit for payments to contractors from the current Rs 30,000 for a single transaction and Rs 75,000 annually to Rs 1 lakh annually. The TDS limit on rent income is proposed to be raised from Rs 1.8 lakh annually to Rs 2.4 lakh. The committee has submitted only a draft report to Finance Minister Arun Jaitley and is likely to present the final one in a few days. Sources said the final report would not be drastically different from the draft. Jaitley said on Monday at an Income Tax Appellate Tribunal event the government was looking at the recommendations to come up with a neater tax regime to reduce litigation. The committee has said nearly 65 per cent of personal income tax collection in India was through TDS and the government should consider making its provisions less tedious. The panel was set up by Jaitley in October to identify provisions and phrases in the Income Tax Act that led to litigation over interpretation. It was asked to suggest alternatives to ensure predictability in tax laws without substantially impacting the tax base or revenue collections. Receiving an income tax notice can be scary for most people. From not filing returns to hiding interest income, the reasons can vary for attracting a notice. Avoid these most common mistakes if you don’t want to get an income tax notice. According to income tax law, if your gross income (without any deductions) is above the exempted limit of Rs 2.5 lakh in case of individuals, Rs 3 lakh for senior citizens (60-80 years of age) and Rs 5 lakh for super seniors (above 80 years), you are liable to file a tax return. Also, irrespective of the fact that your employer has deducted the tax at source (TDS) or not, you have to file an income tax return. Many people also believe that since they don’t have a tax refund to claim, they don’t need to file return. But that’s a misconception. According to Preeti Khurana, chief editor of Cleartax.in, “If you are a resident Indian and you own a foreign asset or are a signing authority in a foreign bank account, you have to file an income tax return irrespective of your income.” If you fail to do so, you may get a notice from the income tax department, she added. Many people knowingly or unknowingly don’t include the interest income from their saving account, fixed deposits and recurring deposits in their income tax returns. The interest from saving account up to Rs 10,000 is tax deductible under Section 80 TTA while interest on fixed deposits and recurring deposits is fully taxable. In case of fixed deposits and recurring deposit, a TDS will be deducted in case the interest income exceeds Rs 10,000 in a financial year. But whether the interest is taxable or not, you have to disclose all your interest income in your tax return. So reveal the interest income in your return and then avail the deduction if any. Not doing so can result in a tax notice. “Notice is issued when tax authorities are of the opinion that you have concealed a part of your income while filing your return of income. Penalty for concealment of income can be up to a maximum of 300 per cent of tax payable.” says Neha Malhotra, executive director of taxation at Nangia & Co.
“The tax authorities can send notices pertaining to years gone by as well. So it is advisable to preserve the tax records for eight years, but where the assessee has any asset situated outside India, he should preserve the documents for past 18 years,” she said. An Indian citizen or a person of Indian origin residing out of India is termed a Non resident Indian (NRI). NRIs are allowed to invest in mutual funds in India on a repatriable or non-repatriable basis subject to regulations prescribed under the Foreign Exchange Management Act ( FEMA). Application form filled and signed by the NRI must be submitted at official points of acceptance. It must be accompanied by payment instrument drawn in favour of scheme. The applicant must indicate whether the investment is being made on a repatriable or non-repatriable basis. KYC papers and copy of PAN must be given. A power of attorney (POA) holder can open and operate a mutual fund account on behalf of an NRI. To operate the mutual fund account, the POA has to be registered with the mutual fund. The POA holder has to submit the original copy of the POA or a duly notarised copy of the POA. The POA must be duly executed with signatures of both the NRI as well as the POA holder. If investment is on a repatriable basis, the payment instrument must be drawn on NRE or FCNR account of the investor. Investments on non-repatriable basis can be made by drawing payment instrument on NRE/ FCNR/NRO account of investor. Redemption proceeds (after deduction of taxes) are paid in rupees by cheque to the account number provided. Some banks also offer direct credit of redemption proceeds to the NRE/NRO account. If investments are made on non repatriable basis, redemption proceeds shall be credited to NRO account. Tax is deducted at source on capital gains made on investments by NRIs. Investments in equity funds held over 1 year are exempt from tax and hence no tax is deducted at source. A digitally signed TDS certificate is sent along with the redemption proceeds. Under section 194D, life insurance companies have to deduct a two-percent tax at source on aggregate payouts exceeding Rs 1,00,000 during a financial year under life policies. CHENNAI: In a quiet move, the impact of which is being felt only now, the statute books have been amended to deduct tax at source on some insurance payouts, which could particularly affect people above 45 and those with single-premium policies. This, by way of a new section — 194DA — in the Income Tax Act, 1961, that took effect Oct 1, and surprised many policy-holders who got to know of it after they received a communique from their insurance companies. Many more are still unaware. “Section 194D envisages deduction of tax at source on the life insurance policy payouts which are not exempt under Section 10(10D),” Vibha Padalkar, executive director and chief financial officer of HDFC Standard Life Insurance, told IANS. Under section 194D, life insurance companies have to deduct a two-percent tax at source on aggregate payouts exceeding Rs 1,00,000 during a financial year under life policies. In case where PAN card details are not available, the deduction shall be 20 percent. For the record, Section 10(10D) of the Income Tax Act exempts any sum received under an insurance policy that is paid from April 1, 2012, if the premium for any of the years during the currency of the policy is within 10 percent of the actual sum assured. For policies taken between April 1, 2003, to March 31, 2012, the condition was that the premium shall not exceed 20 percent of the actual capital sum assured. The clauses were not applicable if the amount received was on account of the death of an insured. “The actual capital sum assured excludes the value of any premium agreed to be returned, as also benefit by way of bonus or otherwise that is over and above the policy amount,” said C.L. Baradhwaj, senior vice president, Bharti Axa Life Insurance told IANS. While life insurers try to ensure that the premium amount is compliant with the Income Tax Act at the product-design stage itself, there are some set of policyholders who could be affected by the new provisions, Baradhwaj said. “All single-premium policies would be the immediate casualty, as the premia paid in one instalment would generally exceed 10 percent of the sum assured,” he said. He said it is possible that people could be paying premia higher than the 10-20 percent limit set by the new provisions on account of their personal health, as also many other reasons. In such cases, too, the TDS liability could arise. “It is important to note that a person aged, say, 50 years, pays a higher premium for the same sum assured when compared to a person who is 35 years old. Higher the age, higher risk and higher the premium,” Baradhwaj added. Industry officials also maintain that life insurance companies have been asked to make a TDS deduction under policies that are deviant of Section 10(10D), since some people were not reporting the same in their tax returns. According to Baradhwaj, if the condition of 10-20 percent is not satisfied, all benefits payable — pertaining to the maturity, survival, or surrender — under a life insurance policy, excluding the death benefits, shall be liable for TDS. A marketing official of the state-run Life Insurance Corporation of India told IANS that policyholders in rural and small towns would be severely affected by the new provisions, as they might not have PAN cards. At the same time conflicting views are being expressed on pension polices. According to one view, pension policies are outside the newly introduced section 194DA of the Income Tax Act as they are outside the scope of Section 10(10D). The argument: Pension policies do not have any death benefit like ULIP Pension Policies, or have only miniscule death benefits like in the current regime pension schemes, so they do not qualify as a pure life insurance policy. “The regulator’s licence allows insurance companies to only deal with the life insurance business. Hence it will be incongruous with the Insurance Act to keep pension policies outside the ambit of life insurance policy,” Varadarajan told IANS. He said pension policy is also a life insurance policy, as it covers the risk of living longer, as opposed to the conventional life insurance policies which cover the risk of dying early. Meanwhile, industry officials agree that life insurers have to communicate with their policyholders about the impact of the new section of the Income Tax Act. 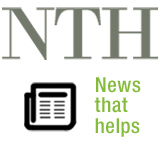 “It’s also important to create awareness among the sales force on the need to tell their customers on the need for proper disclosures to the authorities so that insurance firms can avoid unnecessary policy cancellation requests later,” Baradhwaj said.